Are you at home during the day and looking for an awesome stay at home mom schedule? Here are some factors you should think about while making your own! I’m gonna rock this stay at home mom business. I will have things folded, ironed, and puffed. I will make interesting dinners and coif my hair and laugh at the days to come. It’s going to be so fun not to have a job and I will take a lot of naps. I’m not quite sure when this whole illusion fell through… but it was hard for me. In fact, my hormones got so out of control I had to meet with an anxiety counselor and she gave me a pearly pearl of wisdom. It’s the over-achieving Type A moms who often have the hardest time becoming moms, and an even harder time staying at home. I immediately knew she was right. You see, I was so used to controlling every thing in my environment. Having a baby made me come face to face with a stark reality: there are many things outside my control. And the truth is, knowing that made me want to have a better routine even more. 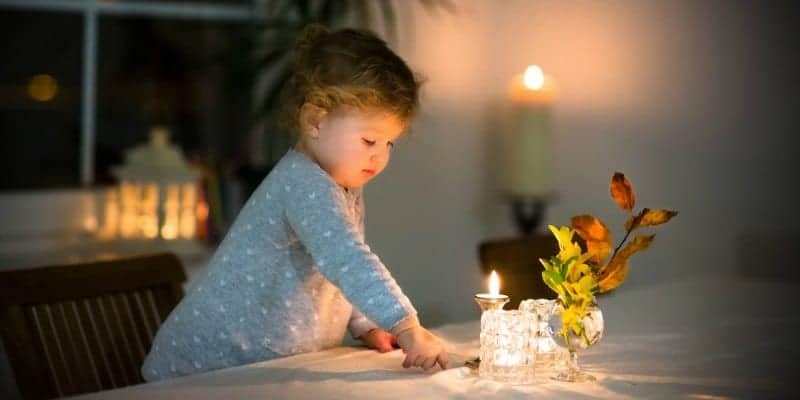 Knowing that so many factors of my day would be up to baby, then toddler, then preschooler, toddler, and baby… that it became of utmost importance that I purposefully crafted my day to benefit myself and the entire family. There’s simply no way around it… without a proper stay at home mom schedule you’ll be running around like a chicken with its head cut off. As a mom at home, your stay at home mom schedule is very important. Here’s how to make a great one. I debated putting this first, but there’s no way around it. If you’re a tired zombie then you’ll have a hard time functioning. No matter how great your routine is, if you’re missing vital hours of sleep you will struggle. You’ll probably even go from being a calm mom to being an angry mom. It’s hard to avoid when you’re experiencing sleep deprivation because severe exhaustion is akin to torture. You’ll need to prioritize your children’s sleep and your own. This means set nap times for the kids and maybe even a power nap for yourself. Encourage your babies and toddlers to sleep longer. Go to bed at a reasonable time, at least one (but preferably two) hours before midnight. Each hour asleep before midnight is worth two after. Maintain a rest time for older preschoolers who have dropped naps. Create effective wind down routines. The more you sleep the better you will feel. The better you feel, the better the home atmosphere. There’s always a lot of talk about getting up a lot earlier than your children. Here is my experience: you need to wake up earlier enough to feel ahead of the day, but not so early you dread the kids waking up. The best stay at home mom schedule takes into account moods as well as times. When I woke up 2 or 2.5 hours before the kids I’d get so engrossed in my work, project, or activity that I almost felt resentful the kids woke up. Because it interrupted my deep work flow. Time management experts suggest having work blocks of 4 hours or so and having 2 or 2.5 to myself got me In The Zone and then…. BAM… everybody needed mommy. I found a better solution. I now wake up around 1 hour to 1 hour and 15 minutes before the kids. I can drink a coffee, read my Bible, exercise, and then be ready to get the kids before I’m mentally committed to something. No one likes leaving things undone so don’t wake up so early that you begin to tackle something you can’t finish. Have a ritual. It may be cup of coffee with Bible or anything that means something to you. By having a ritual you enjoy you’re more likely to maintain this habit. Set up the night before. Have books, coffee, clothes, breakfast – whatever – ready so you can get up and get going. Create a boundary in your home that no one comes out of their room until you come to them… this prevents Morning Wake Time Creep where they wake up earlier and earlier since you’re up and at ’em. When sitting down to create your actual stay at home mom schedule, you’ll need to fill in the framework first. The framework consists of things you feel are fixed and don’t want to move. This might look something like this. 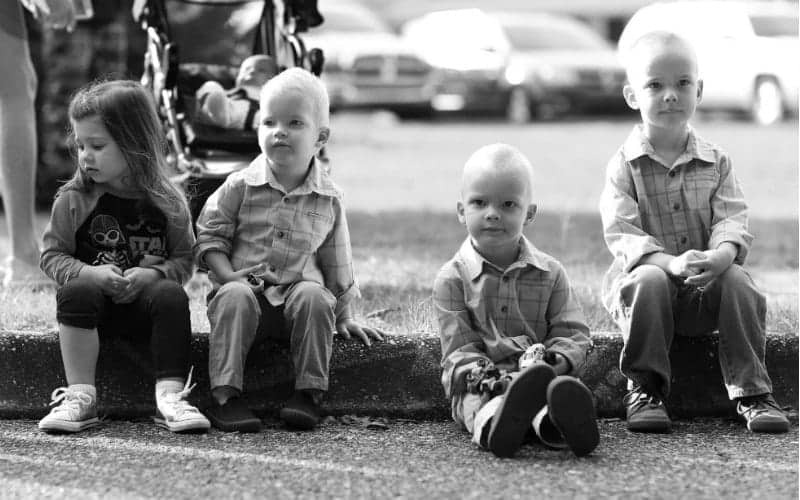 Every family’s will be different, but choose what times you want set in stone and schedule those first. Then you’ll see what time you have left and work around there. The #1 problem when creating a routine is people try to over stuff it. This means you don’t carry it out and think routines don’t work. They do work, they just need some breathing room. I am going to make a confession. I’m not sure whether it’s good or bad, but here it is… I have trained myself to take naps in the afternoon. I didn’t do it on purpose, but I put all the kids to nap at the same time and then… I either work or nap. On a good day, I do both. If you create a schedule and fill every single minute you’ll drive yourself to insanity. 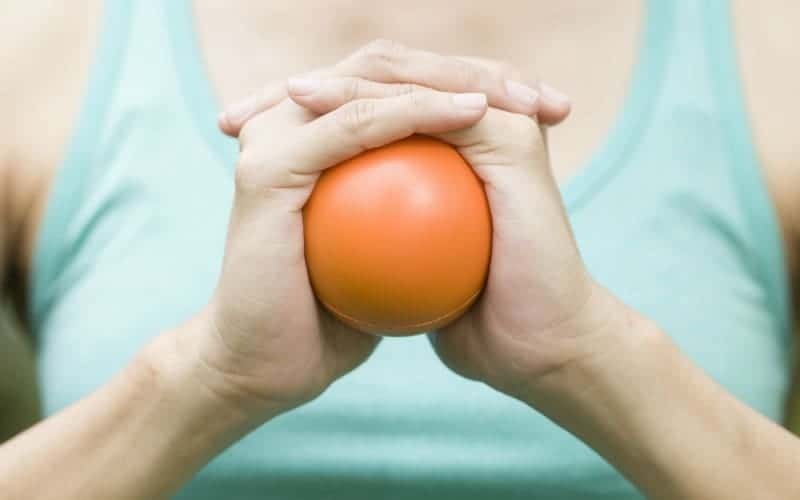 Your stress hormones will rise, you’ll feel anxious, and simultaneously guilty because your schedule will not work and you’ll feel like a failure. A much better idea is to create pockets in your day full of nothing. This means you can fill them with activity or no activity. Enforce nap or rest times with your little ones. Then use that time to rest yourself. Make independent play a daily priority and use that for rest if you prefer to do household chores or work during the afternoon rest. Don’t save all your work for the evenings after the kids are in bed, use that time to connect with your spouse or relax. Want my process for creating a killer daily routine? Sign up for my free 3 part series below and get it straight to your inbox! A large part of being a stay at home mom is creating and maintaining home systems. This means the cleaning, organizing, cooking, tidying, and overall maintenance of the home. Hopefully you have a spouse who knows that helping isn’t doing you a favor. But still, if you’re home all day you likely want to be accomplishing some of these tasks in an efficient way. First, create some daily routines revolving around home systems. Here are some quick and easy tidy routines. Emptying dishwasher in the morning. No child comes out of their room until it’s clean with bed made. Chores after breakfast if there are any to be done. Tidy up before nap time and quick sweep. An evening sweep after kids are in bed. As for laundry, I go back and forth. Often my mother will take clothes home with her. Some weeks I’ll do 2 loads a day. Some weeks I’ll do 7 loads on one day. I cannot decide what works for me, but I have accomplished victory in the laundry area because now – with 5 kids – I simply do not let it worry me. I just don’t. 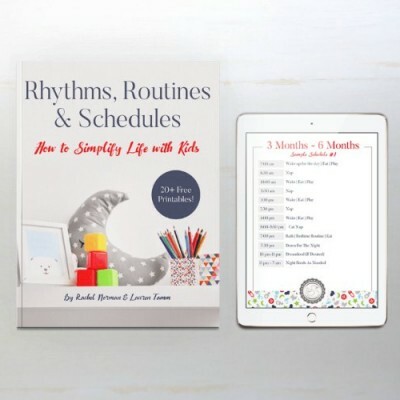 This is the goal… to create and maintain routines that help run the house without running you into the ground. 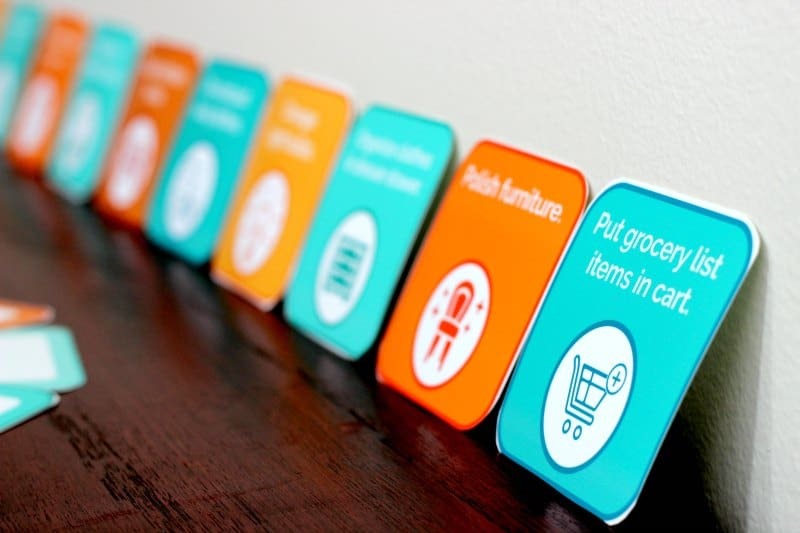 Cards to help you get a good chore system. I have 5 kids so… our schedule needs to serve everyone. I don’t let the kids dictate the routine, I choose a routine I know will benefit us all and we go from there. I choose the wake time and, if they wake a tad early, they play quietly in their rooms until it’s normal wake time. Independent play is at the same time for nearly everyone and this allows me to either spend one on one time with a child or nurse a baby without worrying about what the others will be doing when I’m sitting down. Everyone snacks at the same time, eats lunch at the same time, naps at the same time, then goes to bed at the same time. Staggered so we get individual time with each child, but still in the same window. 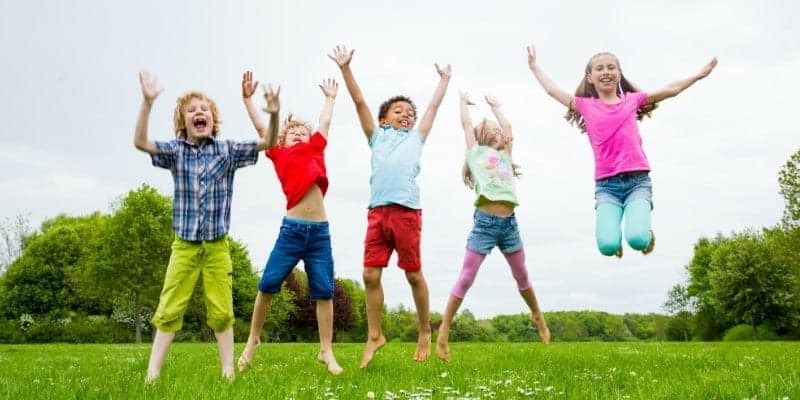 Avoid the trap of letting each individual child create their own routine. Promoting independence is good. Giving your children control that you don’t need is good. But the only way to have a harmonious home with multiple children is to have a routine that works for everyone, but first and foremost you since you’re the one manning the ship. 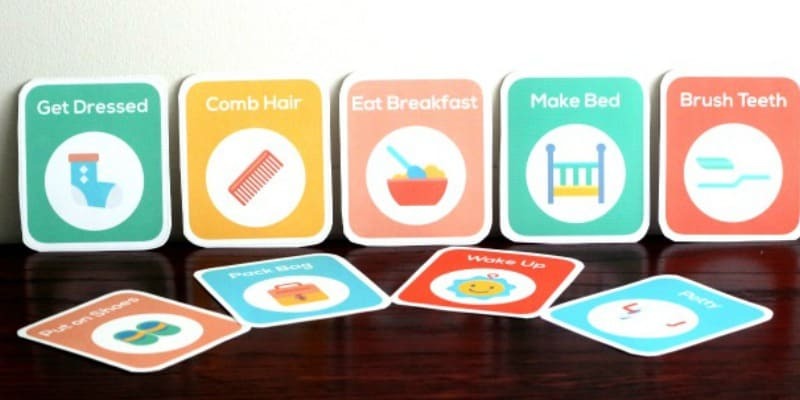 Routine cards you can hang up and help your toddler learn to follow their own routine. The best routines are ones that end up on auto pilot. Even your toddlers can learn to keep their routine if you make it visual. 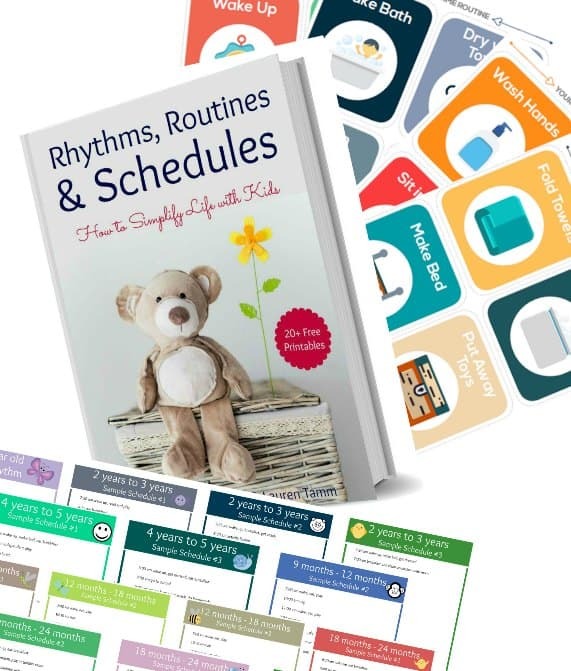 While mama is still in charge of keeping the flow of the day in order, having mini routines within the larger daily schedule helps children join in the fun. These may be as simple as always clearing their plates when they eat. It may be picking up toys after playtime, or having a snack after cartoons. By creating associations you do day in and day out, you decrease the amount of struggle your children have with transition. Your morning routine before the children wake up. Breakfast routines. What to eat, where to eat it, what to do immediately after breakfast. Snack routines. Where to eat the snack, what happens immediately before and after it. Nap or rest time wind down routines. Post nap or rest time routines, this will likely include a snack. Dinner time routines. Who sets table, clears table, does dishes, etc. Bath then bedtime routines. Bath, book, bed, etc. 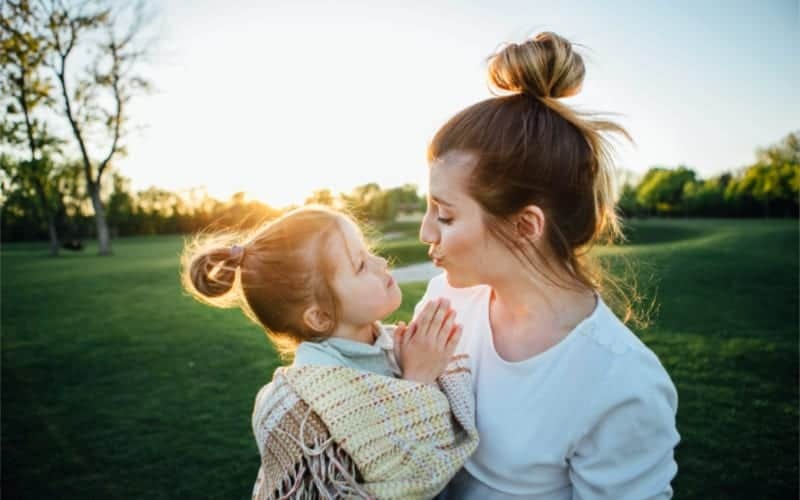 If you’ve gotten this far then I know you’re a mama dedicated to having smooth, functioning, and fun days with your children. If that’s the case, I’ve got some great news for you! 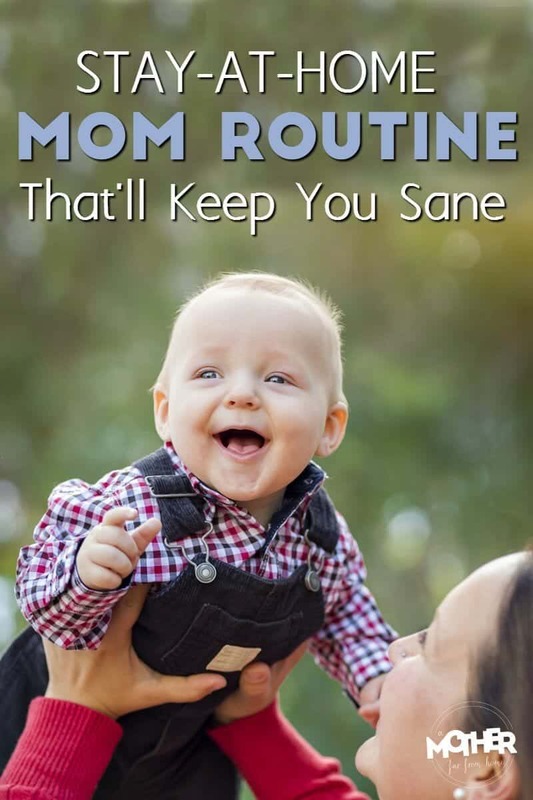 I’ve been helping moms with routines for years and, there’s one thing I know, it helps to have it written down and put where you can see it. 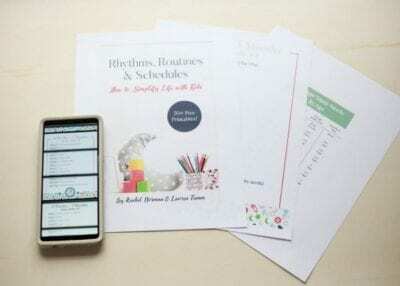 To that end, I’ve created a Stay at Home Mom Daily Routine Pack complete with printables for babies aged 6 weeks to 5 years, beautiful routine cards you can hang up to help your toddler follow the routine, as well as 101+ chore cards to help teach your little ones responsibility. Get your Stay at Home Mom Daily Routine Pack here and start creating more peace and calm in your home today. Mine share a room too and yes, since I use white noise, afternoon naps seem to be smoother and easier. Hi! I have a 2 year old and a 2 month old. The baby rarely sleeps and cries a lot, and we are having such a hard time trying to figure out a routine. How do I bathe the baby and nurse/get ready for bed when the toddler needs dinner at the same time? Our days have to start so early because of work – 6:00 am. Do you have any tips? Sometimes it takes me an hour and a half to get the baby bathed and asleep, and by that time my toddler is in bed and I don’t get to see him. I’m struggling! Also, your weary mom devotional comes to my inbox every night when I’m up with the baby, and it has been so encouraging. Thank you so much! Alicia, I am so happy you are encouraged by the devotional! This phase when there’s a needy baby and toddler is SO HARD. All I can say is to work on the times, try to get your partner to help if you have one so you can rotate baby duty and toddler duty. Will the baby take a pacifier? That often helps! The only trick that worked with my daughter when she was 1 year and a half was to go out to the sandpit every morning at 9:30 AM. By the time we reach 11:00 AM, she got a snack, got back to the stroller, where she fell asleep on the way back home. This routine sets her up for whole day. She is calmer, goes to sleep earlier in the evening. I noticed my daughter sleeps better and is more obedient when I supply her needs for food, drinks and play ahead, in such a way she would get more than she needs or want (plenty of food and play). It makes her more satisfied, relaxed, obedient and grateful. My heart goes with you. Cheer up. Both of my babies have been in their own beds since 4 months old. Recently my 4 year old has started coming into our room in the middle of the night since one night I had to get him up in the middle of the night due to a storm. He refuses to go to sleep alone or stay in his bed all night. Any advice? Lindsay, I’d say do the “silent return” where when he comes to your room you silently walk him back, help calm him down, shush, sing, cuddle a bit, etc. and then repeat. You’ll probably have agonizing few nights and then it’ll work I believe. Hi! I am having the same problem with my 3 yo but In the early hours. Around 4 or 5 am she comes to my bed. I do the silent return and then she usually comes again around 6:30am (our wake time isn’t until 7am) and I do silent return again. She knows when she does this, she won’t get chocolate milk in the morning but she still does it! Seems like it’s been going on for months. What are other ideas? I love these tips! I am not a stay-at-home mom yet but once I have kids, its my dream! I love how real and honest you are with this post. I think I tend to glamorize things (including being a stay-at-home mom) so this really helps give me perspective and sets me up to be able to rock the stay at home thing…well eventually it sounds like ;) Thank you for sharing! My toddler is 1.5 year old and he sleeps very late at night .. ard 1:30-2 am. He wakes up with me by 7 something, plays n goes back to sleep by 8:30 n doesn’t wake up until 12-1 pm. That way he misses bfst every single. I tried everything to create a proper routine for him n put to bed by 8:30 but he wakes up by 11:30 pm to play which disturbs our routines too. Your advice would be a great help. Hi there. So you shouldn’t elt him sleep the day away. The best way to keep him from staying up all night is to keep him up in the day. Take him somewhere to do something fun, etc. u ntil he realizes that day is day and night is night. That’s what I’d do! I love your schedules. You address EVERY aspect from taking care of one kid, to many, finding time to take care of yourself, the house and your marriage. One question that o don’t really see addressed in any newborn schedules. I FINALLY figured out the reason my son wouldn’t sleep longer than 45 min as a baby was because the pacifier was a crutch. It’s a little weird because he would go to sleep without it, but need it to fall back asleep. I am assuming this is because when he was a brand newborn I’d go out it back in every time it fell out since he was swaddled. (Yes this was exhausting!!) I know you said not to let the pacifier become a crutch which I definitely inadvertently did. I Don’t want to fall into this bad pattern with my next because it made me miserable. You did address not putting the pacifier back in but what DID you do instead? Did you let he naby cry and cry, or fuss for a bit and then go in an calm down? Pat on back, pick up put down etc etc. obviously I realize as the baby get older they should be able to just go back to sleep but I had a hard time with the concept of letting a brand spanning new baby just cry and cry. I want the baby’s brain to learn I am head for them to comfort them and meet their needs, balanced with them learning to do things on their own that may be painful or uncomfortable. What worked for you? Hello im so glad i came across your article. I have a 8 year old and now a 6 month old. I started staying home since my 6 month old was born and i have to admit it is not what i thought staying home would be. Its definitely overwhelming at times i feel that working was easier than staying home. This past months i asl myself how do other stay at home moms do it? What am i missing? I love your posts. I always learn something. I am struggling so much. I have 3 children 5 and under and I’m just plain exhausted. I feel like 9 hours of uninterrupted sleep every night would cure me but that just ain’t happening. Also my toddler and baby won’t nap at the same time anymore :-( my toddler just isn’t tired when the baby goes down and the baby won’t take his second nap anymore (he is 13 months)! Love the post! Currently we have 7 kids in the home. 5 are ours 2 are my niece and nephew we took in. They are all under the age of 10. Im having a hard time with a summer routine. I need activities that I can get our 9 year old through 2 year old to be interested in. If they aren’t fighting over a toy, pencil, book or who had what cup they will fight over me! I noticed I have gone from mom to drill sergeant I dont get to enjoy them or have fun with them because everything turns into a fight. Any advice is greatly appreciated. posts. Congratulations on the extra effort you take to build a great article. You can actually wake up before your kids? This has never ever happened to me. Forget early morning showers, if we woke up at 5am mine would demand to be downstairs and scream her head off until we took her downstairs too. Such a great article. I just started staying home recently and will definitely be implementing some of these tips! I have a 5 year old and a 2 year old with a baby on the way! We are trying very hard to arrange things so I can stay home for the baby’s first year. Childcare costs for the three children would take over half of my income (teacher) so we are trying to grow/start our side businesses and I’ve been worried about how to manage 3 kids at home (which I’m not even used to because I’m a working mom) while contributing to growing our businesses from home. Yikes! Needing routine ideas stat! My 5 month old wakes up anywhere between 6:15am-7:30am. It used to be after 7am consistently and I was planning to wake up at 6am to get a 30m workout in and read my Bible but now that it is sporadic, the last thing I want to do is get up at 5am. I go to bed at 10:30pm. I also try to work 2-2.5hrs a day and wanting to start up a blog. I’m having trouble fitting that in and having quality time with my husband after 8pm when baby goes to sleep. That only leaves approx 2hrs for us. I’m a perfectionist too. What would you do?